Four people from four corners of the country formed a band a few years back. They started singing Christian Hymns. They had a good time indeed, using their talents for God. Now they are in different parts of the country. This post is a dedication to all my four buddies who made NEWS. If you wannu know why the name, "NEWS"? ; It is cos , they were from north, east, west and south corners of the country. Lari- He is an amazing guitarist. He is from Shillong. Daphy - She is also from Meghalaya. She is a very powerful alto. Chriz- Oh yea! That's me. From the southern tip of the country. We had lovely jamming sessions and I really miss the fun we had in college. In this picture,we can see Lari, Sonya, Xavier and Me (L to R). 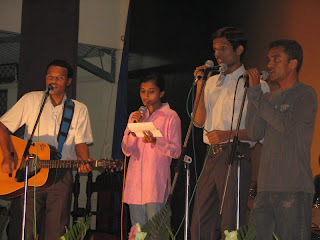 We were performing for our inter college fest. Memories sometimes pull us back to those days and I can experience goosebumps all over, as I type this line. In the following video, you can see Daphy, Xavier, Me and Lari singing christmas Carols.. Hope you would enjoy the song,"Everybody likes to take a holiday"
But it seems like someone has NO,simply NO darned time to visit my blog. Reminds me of my best buddies too.....lovely post.....loved the video LOL! PS- Like aayushi says, if u get time.....do pay me a visit too!!! So where's NEWS now ? LOVE THIS VID!! You all do a great job!! GUess you're all settled up,eh ?